House & Garden A&B soil base nutrient is designed to be used only in soil and works best with House & Garden soil mixes. The unique composition of soil nutrients requires an extremely precise composition of the various minerals which ensures that soil and nutrients are used to their full advantage. House & Garden two part soil nutrients are soil specific nutrients. The special composition of the nutrient solution leaves the water reservoir pure and keeps it fresh. At the same time it provides an excellent balanced nutrient ensuring optimal absorption at the root zone. House & Garden soil base nutrient is composed of liquid nutrients and trace elements and contains no bulking agents which make the transfer from the root zone to the plant easier. Soil base nutrient is composed from the purest high-quality nutrients that are available on the market to date, including Eddha-Fe (iron). This enables the plant to absorb the nutrient fast and effectively. 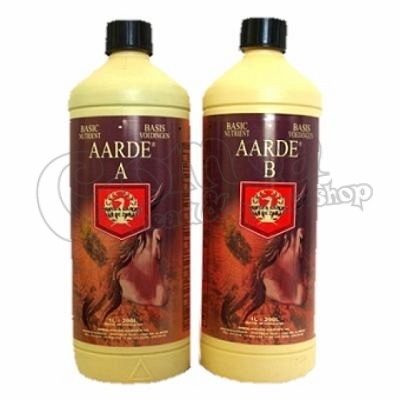 In short if you want an excellent start for your plants use House & Garden A&B soil. House & Garden base nutrients contain a full range of beneficial elements, Humic and Fulvic acids improve the uptake and transportation of nutrients which in turn will promotion healthy plant growth and absorption capacity of the root zone. For best results use House & Garden soil mixes.